Prior to writing the first part I wasn’t sure whether I should stick this in the industrial or the metal section. In the end I went with metal because I’ve always regarded both Rammstein and Pain as metal, so naturally a collaboration between Mr. Lindemann and Mr. Tägtgren belongs in that category too. I can’t think of any better way of describing this album than how I summarized it in my review: “It takes you on a journey during which you will experience a whole range of emotions including fear, laughter and disgust.” Best tracks: ‘Fish On’, ‘Praise Abort’ and ‘Yukon’. The second entry on my list couldn’t be much more different than the first. Whereas ‘Skills in Pills’ was fun to listen to, making me dance and laugh along to the outrageous lyrics, ‘Feel the Misery’ is true its namesake. There’s nothing uplifting about this album, just eight beautifully crafted songs of doom and gloom. In short, it’s a classic case of My Dying Bride doing what they do best. Best tracks: ‘And My Father Left Forever’, ‘Feel the Misery’ and ‘I Celebrate Your Skin’. At the time when I reviewed this album, I gave it a very conservative rating of 3.5/5. Since then I have listened to it on numerous occasions and I’ve grown to appreciate it. If I were to do the same review today I would probably rate it much higher. ‘Hammer of the Witches’ is easily Cradle of Filth’s best album in years. The best tracks are ‘Blackest Magick in Practice’, ‘Enshrined in Crematoria’ and ‘The Right Wing of the Garden Triptych’. This was a tough album to review mostly because it’s so distinctively different to anything that Apocalyptica has ever done before. As with the new Cradle of Filth, it took me a few listens to fully appreciate it. The cello sounds were an instant hit but Franky Perez’s vocals are not the easiest thing to get used to. Luckily I discovered that once you do become accustomed to it, you will be rewarded for your patience. Best tracks: ‘Shadowmaker’, ‘Cold Blood’ and ‘Riot Lights’. Lacrimosa is one of my favourite bands. Their music isn’t the easiest to classify. I and many other people I know have always regarded them as Gothic rock, but if you ask anyone from the Goth scene they are viewed as Gothic metal. ‘Unlike its predecessor ‘Revolution’, which had a lot of metal influences, Hoffnung’ marks a return to the symphonic and orchestral style of Lacrimosa whilst still retaining the Gothic elements. Best tracks: ‘Unterwelt’, ‘Die Unbekannte Farbe’ and ‘Thunder and Lightning’. Whilst Lacrimosa’s classification as “metal” may be subject to debate, this one is definitely not metal. However since Marilyn Manson’s latest album has nothing in common with industrial music I decided that it was better suited for the “metal edition”. ‘The Pale Emperor’ isn’t a masterpiece like ‘Antichrist Superstar’, but it’s the best album I’ve heard by him since ‘Eat Me Drink Me’. Best tracks: ‘The Third Day of a Seven Day Binge’, ‘Deep Six’ and ‘Cupid Carries a Gun’. I Worship Chaos’ is another solid effort from the world-famous Finnish extreme metal band. I must admit that I was apprehensive when I heard some of the previews on Youtube. Luckily after getting my hands on a physical copy and listening to it in full, I’m happy to report that it’s better and more memorable than their previous work ‘Halo of Blood’. Best tracks: ‘Morrigan’, ‘Horns’ and ‘I Worship Chaos’. I only discovered Melechesh recently after reading one of the reviews on this album. I like their unique style and the mixture of middle eastern folk music elements with black metal. It’s also a great way to learn about Sumerian mythology. Best tracks: ‘Tempest Temper Enlil Enraged’, ‘Lost Tribes (feat. Max Cavalera) and ‘Metatron and Man’. For those who don’t know death metal is one of my favourite metal sub-genres. Nile is one of the bands that I grew up listening to. I briefly lost track of them after the mediocre ‘Ithyphallic’ album but after reading a review of this album I decided to give them another go. I’m glad that I did. It’s great to see that these guys haven’t mellowed down or changed their style drastically. Best tracks: ‘Evil to Cast Out Evil’ and ‘In the Name of Amun’. I don’t know much about speed metal. The chances are had it not been for Ranger’s highly entertaining performance at Radio City South Park festival, I wouldn’t have paid any attention to this album. Their debut ‘Where Evil Dwells’ treats you to seven tracks of ultra fast and energetic speed metal. A must for fans of the likes of Exciter and Witchburner. And who knows… maybe we will finally get a new Metallica album? 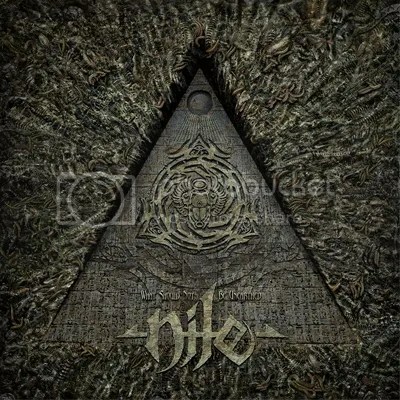 Nile are just one of those bands who have miraculously passed me by. I’ve always known of them, and even more or less what their sound and content is all about. It’s just that the jigsaw pieces were never quite in the same place at the same moment, so this is one of those occasions where I get to make up for lost time and broaden my musical horizons in a very enjoyable way; the way of theologically horrific death metal! Spin one, and it’s instant, visceral blast after visceral blast, direct to the face, and I instantly regret not having followed this band more closely in the past. It’s all about investigation and discovery, though, so back I go, through the sands of time, right back to the beginning. In truth …Unearthed 100% plays the older and more cultured brother to all of their previous releases; a natural progression point to be expected from a band of Nile‘s vintage. There’s an obvious easy confidence carrying this thunderous uproar that comes with settling into self-assurance in one’s abilities; not arrogance or cockiness, but a belligerent nonchalance, blazing through mind-bending intricacies with a comfort not previously displayed. Yet behind every blinding flash of frenzied frettage is an undeniable musical intelligence. Too often bands which fall under the ‘technical death’ banner are only really any good for one thing – shredding. While anyone who claimed that Nile couldn’t give these musicians more than a run for their virtuoso money would be, quite rightly, decried as a fool, they are leagues and aeons away from being branded in the one-trick-pony trap. They seem to be at a stage where they are more happy than ever to slip into a thick riff, owning it entirely, and there’s plenty of the atmospheric character shown in previous works such as (the reportedly less-well-received) At The Gates Of Sethu. Some of the best recordings in extreme music are those which you can listen to in quiet reflection, but which also grow arms and legs of engagement when the volume is cranked up to the point of a physical sensation of sound. This is definitely one such, and more, it is razor-sharp precision work, with youthful intent and intensity. In terms of quality, 2015 has been a somewhat golden age of metal so far. What Should Not Be Unearthed is simply the latest nail in the sarcophagus. 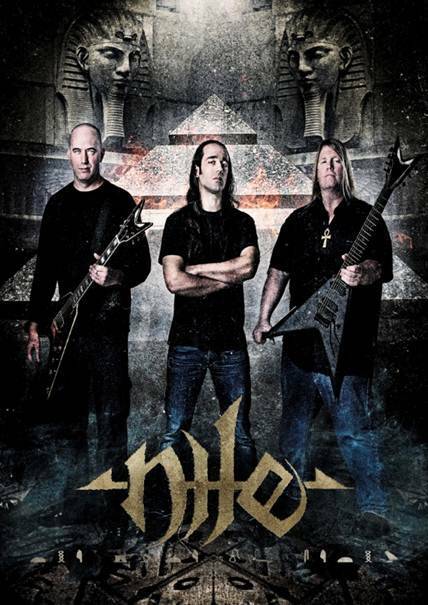 US death metal pharaohs Nile have announced a UK tour for June. 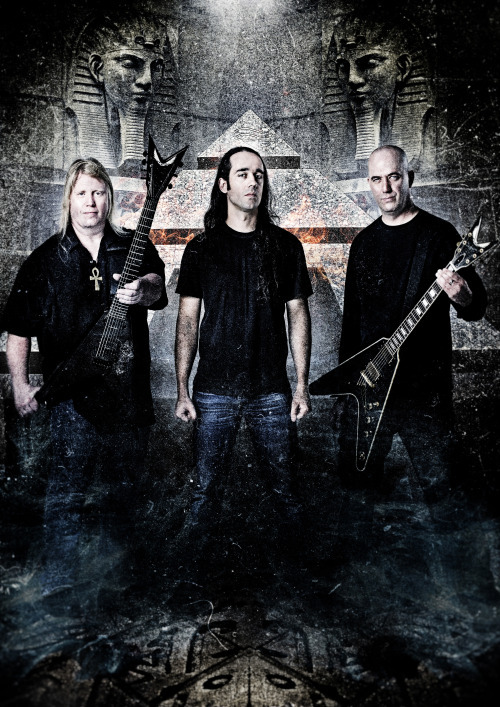 Legendary US power metallers Vicious Rumors are confirmed as special guests for the tour. Kemetic-themed death metal pharaohs Nile are heading back to Britannia’s grand shores in June for for an exclusive appearance at London’s premiere metal venue Underground. The show will take place on Monday 23rd June and tickets are already available at this location. Special guests for the show are legendary power metal warriors Vicious Rumors. Hailing from the Faroe Islands, Týr are currently recording their new album with producer Jacob Hansen (Volbeat, Aborted, Mercenary) at his studios in Denmark. For drum tracking on this album, Týr have enlisted the services of George Kollias, one of metal’s most accomplished drummers, primarily known for his work in Nile, as well as Nightfall. A video featuring drum tracking highlights, as well as a short message from Kollias, is streaming now on YouTube, which can be viewed here. Hey Týr fans, this is George Kollias and I hope you are ALL ready for a crushing new album from Týr!!! I had the pleasure to record the drums on the new album, we had an absolutely great time in the studio and I gotta tell you, the material is super strong and catchy, I’m 100% sure you will all love this new album!! Big thanks to Heri, Terji and Gunnar for the opportunity and to Jacob Hansen for his incredible work with the recordings! It was a pleasure to have George in studio. He’s an amazing drummer and he certainly made an impact on this album. We’re very excited to release this album. We regret to inform you that Kári Streymoy and the rest of the band have parted ways. Kári suffered a back injury in 2008, and since then he has had some issues with his drumming. That is the main reason that the co-operation has been problematic for some time now, and we finally decided to part ways. We want to thank Kári for his time in the band. It’s been great to have you with us, we wish you the best of luck in the future and we hope you recover fully some day. I am very happy to announce that I will be joining Týr for the duet The Lay Of Our Love on their up-coming album (title still to be revealed), which is set to be released this Fall. Heri already joined Leaves’ Eyes at our headliner show in Wacken Open Air 2012. This was an absolute highlight during our live performance, moreover, I really like his voice and I am grateful for the invitation. A superb track, with inspiring melodies and lyrics, proving the authenticity of Týr. More details will be unveiled in the forthcoming months as music and art are completed. The band has been posting images from the studio throughout the recording process, so make sure to follow them on their official Facebook page for candid photos and personal updates from the band.